“You’ve Got Mail!”…. But, Do You Care? Email has become one of the primary methods of communicating information to veterinary clients, and can be the foundation of a successful businesses marketing strategy. But it is important to realize that while there are benefits of emailing clients, there are also challenges, and these may be impacting your ability to communicate important information to your clients. What are the benefits of emailing? It’s inexpensive – You have the ability to reach hundreds or thousands of people with the same message for a very low cost, or perhaps no cost at all. Emails can also be created relatively quickly, and made to look very appealing and easy to read. It’s global – With wireless internet connections being commonplace, the widespread use of mobile devices enables an almost instantaneous method of sending and receiving communication. Nearly half of emails are opened on mobile devices, so it’s a great way to reach busy people on the go. What are the downfalls of emailing? It’s a saturated platform – Since so many businesses are using emailing to market their products and services, a user’s inbox can quickly become filled to the point where they may be forced to do a “delete all” just to regain control of the situation. Add to that the fact that work and home-related emails are also coming in, which makes your very important email easy to miss in all the noise. Open rates are dreadful – It’s true. According to a study, in 2017 the average open rate for email campaigns across all industries was 24.79%. It’s highly likely that your emails are also only being opened by one quarter of the clients that you are emailing. Not everyone on the planet is a marketing pro, has won a spelling bee or has a good eye for graphic design – Emails that are being delivered may have an amateur look, with too much text, misspellings and poor grammar, or images of different sizes and placement. They may be too long, difficult to read or understand, and they may not have a point, or an appropriate call to action. So how can you increase the chances of clients opening emails? Before we can determine that, it’s important to nail down the basics. Do you have the right email address? A recent study showed that on average, people have around two email addresses; a primary and a secondary. Further studies of 600,000 email addresses showed that read rates are 14 times higher on the primary email than the secondary email. Something else to consider is if the email you have is still valid. It is not uncommon for people to completely abandon an email address and start a new one. In fact, 30% of Americans change their email address annually, and 17% are creating a new email address every 6 months. Are you asking your clients at every visit if the email address you have on file is still correct? Are you a trusted brand? Consumers are more likely to share email addresses with a business that they trust. As veterinarians, the caretakers of one of the most important thing in someone’s life, trust is one of the foundations of the veterinarian-client relationship. When you utilize a client engagement platform with messaging that is synchronized and similarly styled, whether you are sending your message via email or a push notification, clients will begin to develop brand recognition, which leads to higher levels of engagement and trust. If your method of asking is “what is your email address?”, your phrasing may be the issue. You may be seeing a low collection rate if the client does not have confidence that you aren’t going to spam them, or sell their email off. Consider asking in a different method, where you are actually explaining to the client why they should provide it at the same time you are asking. “Mrs. Ekola, what email address would you like us to associate with Murphy’s medical record? The doctors will sometimes communicate important messages through email.” By explaining to the client what the benefit is to providing their email, you will help alleviate any anxiety the client may have in providing it, which will help build trust. How many emails are you sending? Take a look at the last five to ten emails that you have sent out to your clients. How many emails did you send in the past week? How many were sent in the past month? The number one reason that clients unsubscribe from a businesses emails is because they were getting too many. There really isn’t a recommended number of how many emails is “too many”. If you are sending a weekly blog, and it clearly states that it is weekly, then there is some expectation from the recipient that they will be receiving emails from you at least that often. If you only send emails on a somewhat random basis, the best way to gauge this for your practice is to put yourself in your client’s shoes. If you were to get three to five emails a week from a business in your personal inbox, would that seem excessive? What if you were getting one per week? Or one every other week? Use your experience as a consumer to decide the most appropriate timing and frequency for sending emails to your clients. At the bare minimum, Mailchimp recommends sending one email campaign per month to keep your clients engaged. However, they also recommend planning ahead, if you will be sending out emails more frequently during a specific time of year, or for a specific event, to make sure you are not overloading your client’s inboxes. What is the quality and content? If you want your email to be read, there are a few key points that you should keep in mind when developing the content. First, remember that you are dealing with busy working people and families, so keep your message short and to the point. Second, be sure that the content you are sending is relevant to the client who will be reading it. For example, if you have an important message to deliver that is only relevant to dog owners, it is ok to exclude your cat only owners from receiving the email. It’s also important to note that emails with graphics have a higher open rate than emails containing only text. However, if you are throwing in graphics just for the sake of having graphics, you may be doing yourself a disservice, especially if the image doesn’t really have anything to do with the content of the email. There are many websites that offer free stock photos of animals. As veterinary practices, it’s hard to imagine why we would need to use very many stock images, when we have thousands of adorable animals coming through the doors that we could take photos of. Using photos of your own patients will give your content more credibility than using a generic stock image off a website. ► Ask clients at every visit if the email address you have on file is still the best one. If you don’t have an email on file, get one! ► Send appropriate and meaningful content with limited text. Include a call to action if possible. ► Use your own photos. ► Utilize a service like Mail Chimp or Constant Contact to make visually appealing emails and track your open rates. 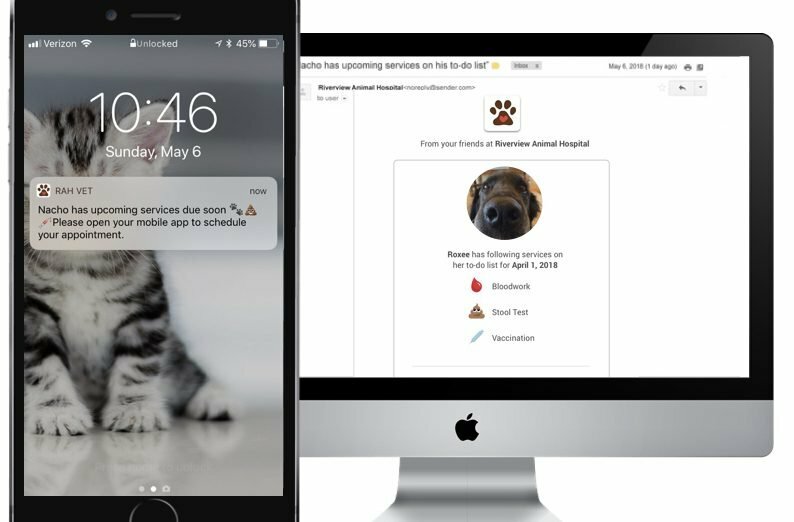 ► Get a client engagement platform like Vet2Pet, which will help you capture your client’s attention with a mobile app that collects email address and automated branded personalized eye-catching reminder push notifications & emails.